Enter daily for a chance to win over 100 fabulous prizes. 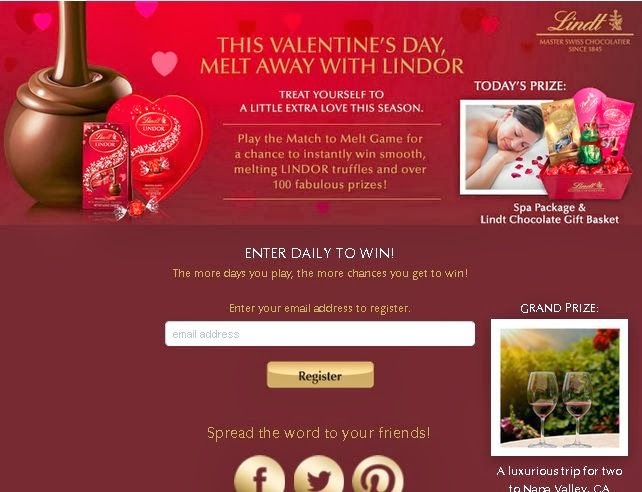 Today the prize is a Spa Package & Lindt Chocolate Gift basket @ @ Lindt Chocolate USA. The grand prize is a luxurious trip for two to Napa Valley, CA. Click the link below to go to the Lindt Chocolate USA Facebook page. Once on their Facebook page, "Like" them to get started.